In any service business proper record keeping is vital to long term success. As a contractor, both you and your clients will benefit from a detailed invoice the lays out the details of your arrangement in a way that is easy for both parties to follow. There are many ways to put together an invoice, but using a good contractor invoice template will allow you to implement this marvelous tool quickly and easily. A good invoice template will start off with your business name and clearly state that it is an invoice so that your client knows exactly what they are looking at. It will include a date and invoice number; these are for your records and allow you to easily identify jobs in the future. Next you will have a space with your contact information, for your client’s benefit, and ideally for your website and/or PayPal information. You will also want space for your client’s contact information so that you have an easily accessible way to communicate. In the modern world payments are more and more often rendered electronically, so a good invoice will show your client how to make a payment in the way most convenient to them. All contractor invoices will need a detailed list of services rendered, preferably itemized and individually priced so your client knows exactly what he or she is getting, and a similarly itemized list of expenses. You should subtotal both sections and then clearly state the final cost of the job at the bottom of the page, along with any specific instructions for payment. The best invoices are simple and easy for the client to read, but even a simple document takes time to create. 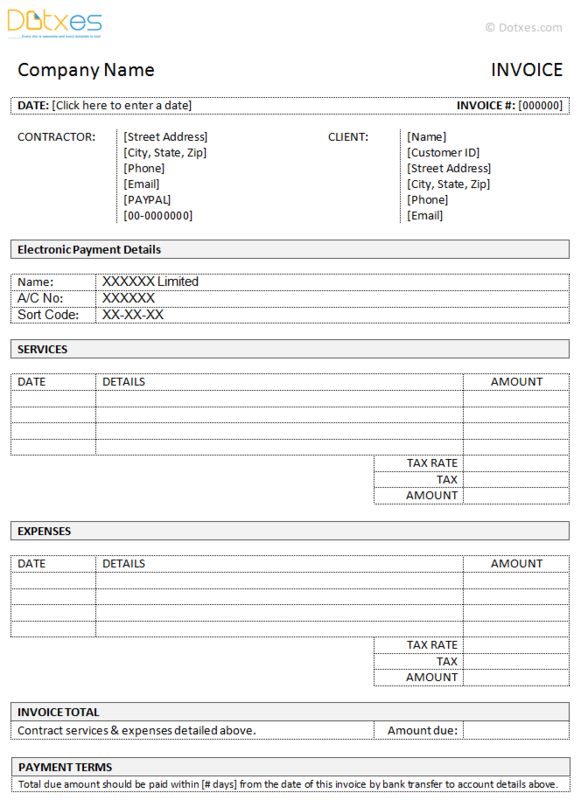 This contractor invoice template offers you all the benefits of a great invoice that you can begin using immediately, saving you time, money, and hassle. Simple to download for free – will happily come back and pay a few dollars now that I know the site is worth it.